Its just got to be a favourite, a stunning tapestry of colour! what a wonderful spring garden you have. I think out of all the seasons spring is my favourite. Looking forward to seeing your summer display. Oh my! Its like a pic from a magazine...eat your heart out Thompson & Morgan..your stuff never looked like this!!! what a picture!!! can you make jigsaw puzzles cos this would be lovely. What a splash of colour, it looks wonderful. would certainly be a puzzle! but a lovely one. im having to water my garden ~ i dont remember having to do that before in april!! Me too Sticki, its a bit desperate! it clouds over some days but no rain! probably waiting till i go on holiday!! Oh dont say that Lol, were you going? ... and the waterbutts are ready and waiting ! im going to the isle of Islay in the hebrides, scotland grandmage! could you ask budgie to do a rain dance for the midlands too please TT? excellent ~ thank you crocus! dont get too tired tho!! Wow, beautiful garden TT, what a picture. and here I thought you were just about dogs. Fabulous display, a heart warmer. U got it right, a 10. Lovely, colours they all blends in a treat! In your garden it isn't difficult to see why! That's a gorgeous photo TT, am putting it on my favourites. Fabulous colours - going straight to my faves as well! That is so lovely Terratoonie. The blend of colours are beautiful and I love Conker. Give him a hug from me. Conker sends you a big <hug>. Wow Terra, Want a job as my gardener? LOL. Your garden is beautiful, what is the yellow amongst it. Everything blends in so well with one another. You should be proud of yourself it's lovely. Please let me know if you get a few free hours!!!!!!! Haha! Great show of Spring colour and Conker looks well. What more can I say? I agree with everyone, it's truly fabulous - the work of an artist. Hi Lin, Linda and Gurth ... thanks ..
Agree with everyone - what a beautiful display. Could sit and look at it for hours! Now THAT'S what Spring should look like! t.t its stunning ......................... wow carnt wait till i have mine like that !!! check out the new gnome on our latest pic.. LOL. gnome .................. wheres ur new dogie frend lol . doggie friend awaiting summertime paint job..Lol. well done on winning a gnome ! Not too much rain this spring (just a lot for the whole rainy season). Our rainy season is done, it probably won't rain again until the end of November or December. OMG ... TT you have the most colorful garden... Loved it! everything seemed to grow even taller after the icy winter ! I've said that many times: you're a Master!!!! and this year, everything is growing like crazy ! The spring colour seems to have stayed a long time with you TT, the flowers don't seem to want to leave your lovely garden...or Conker! ;0) Gorgeous! ... the spring colours seemed extra bright this year ..
i find alot of spring flowers are nice this year, wonder if its anything to do with the very cold weather we all had this winter. Love this pic. Absolutely gorgeous!! 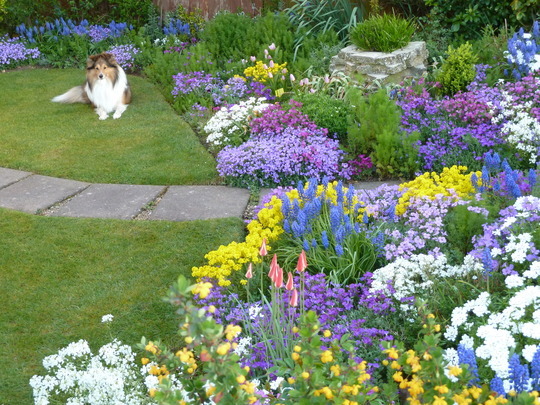 What a feast of spring colour Terra. Best time in the garden, after a long winter. Then it's mostly tucked away for next time round. Aubretia is the longterm flower. Mine are just coming back into flower. They looked dead after the long drought.....but the rain has livened them up. Yours are magnificent. Jersey plants seem to have red ones. Not sure they fit in a spring garden. There are some up the steps I would like to replace with a wider planting and let the alliums grow through them. Beautiful: tell me, please, what kind of flowers did you put there? These are mostly aubrieta and grape hyacinth (muscari). What do you grow once the aubrieta and grape hyacinth are over??? Catching up lol.......I have never seen a prettier spring garden ever TT. I trim the aubrieta back into tidy shapes, and I leave the grape hyacinths to die down naturally. For sure, the best garden arrangement of this year, referring to so many reactions! Truly gorgeous. All those colours work so well together.